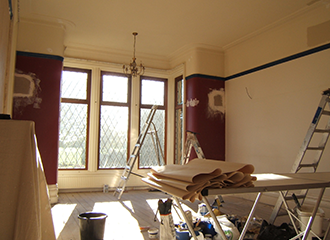 Providing beautiful and unique designs for painting and decorating service always remained the aim of our company, London Local Builder. We can turn your ordinary looking house into something so attractive and modern through our painting and decorating service that those who will visit your house will not be able to stop themselves from praising your house. We take every painting and decorating work of ours as a challenge, not a job. This is what let us provide the best result to our customer in all over London. We provide attention to even the smallest of the details. So, there is no chance that anyone will be able to find a single mistake in our work. The Excellency that you will see in our work has come after years of hard work and dedication is the field of painting and decorating. Our workers have amazing knowledge about the various composition and combination of the colours. So, they can provide some unique and eye-catching painting work without much difficulty. We provide interior designs and decoration with the use of best quality materials. Our company, London Local Builder is fulfilling the dream of thousands of people living in London to have a luxurious house since a long time. We possess some of the latest and modern equipment that led us to do quality and delicate works within a very short time period. Mail us for more information.